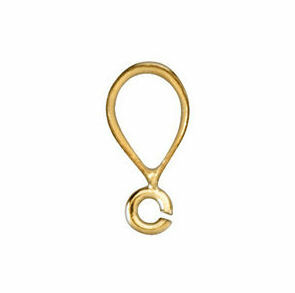 Description: Replacement bail for pendants and lockets with an open jump ring at the bottom. 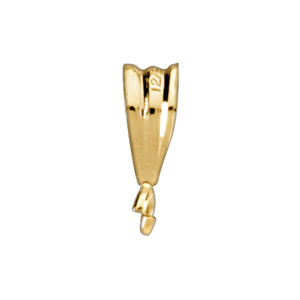 Available in 14k yellow gold filled or sterling silver. This type of bail is good for items that have only a small ring or narrow opening to attach the bail to. The ring can be left as is after attachment for smaller or lighter pendants. 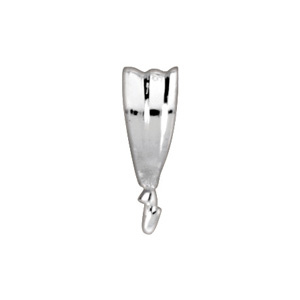 It is recommended on heavier or large pendants�to�have the ring soldered closed for added protection. Measurements: Measures�9 mm in length by 3.8mm at the widest point with an inside diameter of 2.75 mm. Fits a 2.70 mm or thinner chain.